Ise Kadoya Struggle IPA is a 7% American IPA from Ise Kadoya, based in Mie, Japan. It’s part of their limited edition range and unknown whether this is a one-off or not. Ise Kadoya Struggle IPA is brewed with 10 (yes ten!) different hops, which are Amarillo, Cascade, Centennial, Chinook, Citra, Cluster, Mistral, Mosaic, Simcoe, and Zeus. Perhap that was the struggle? 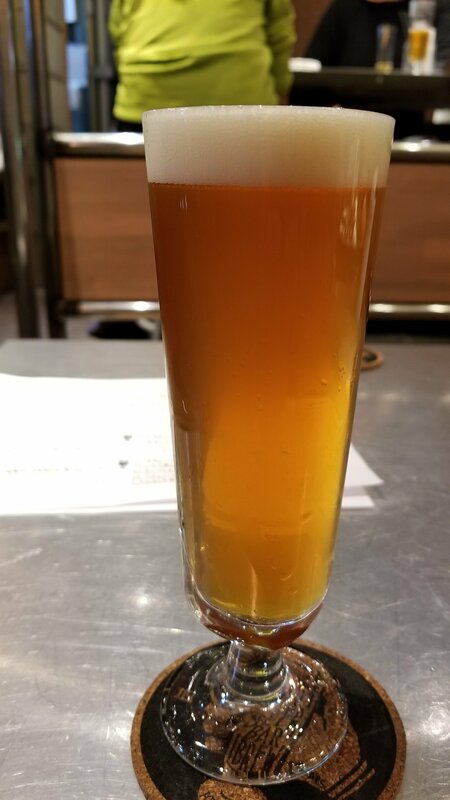 Ise Kadoya Struggle IPA came up a hazy orange colour with a slight golden hue to it, along with a plump white head on top. The aroma was mixed. Very mixed. Huge fruity nose of lemon, grapefruit, peaches, pineapples, and mangoes, but not much going on from the malt. If there was, then I must have missed it throughout drinking. The body was very much a case of less is more. With 10 hops going on, it was always going to be a struggle to get all the aromas from the hops. Some of the hops even seemed redundant. There was a strong bitterness to Ise Kadoya Struggle IPA but the fruitiness came through. It was similar to the aroma, with lemon, grapefruit etc going on. However, it just didn’t excite me at all. Call me jaded but I want an IPA to blow me away if you’re going for so many hops. Ise Kadoya Struggle IPA finished off with a light flourish of bitterness and fruit but by then, I was bored. It’s been a while since Ise Kadoya brought out a beer that I didn’t enjoy or recommend – Ise Kadoya Struggle IPA is it.